Barstow mathletes are back at work and strategizing for success in the 2018-2019 competition season. 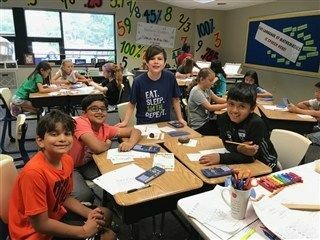 Math clubs are among the school’s most popular lower and middle school extracurricular activities, with more than sixty students in four grade levels meeting weekly well before the school day begins. Ms. MacAleer and Ms. Keith lead students through math challenges and strategies to prepare them for local, state and national contests. Grades 4, 5 and 6 math clubs meet Wednesday mornings and 5 grades 7 and 8 meet on Fridays. Ms. Keith said math clubs are open to every student in those grades regardless of their skill level. 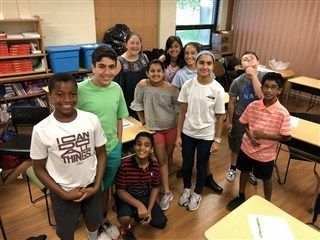 By the time Math Madness competitions begin the first week of October, Keith anticipates having about 50 students attend the middle school sessions. Doing the math, that’s over 30 percent of middle school students. New this year, students in grades 3-5 will also participate in Math Madness, an online contest in which students compete against another school in the United States each week. Math clubs already have a full slate of regional competition scheduled, included an Oct. 27 contest for grades 5-8 in Bolivar, Missouri, the 14th annual Barstow Invitational on November 30 and the MATHCOUNTS Regional at Burns and McDonnell on February 2. Check the Barstow calendar for more dates and times throughout the year.